This is a review of the Dimplex CS-12056A Compact Electric Stove. In this review we will help you to make an informed purchase decision by examining all of the benefits and features of the stove, and by critically assessing the positive and negative reviews of the customers that have purchased the unit. The Dimplex Compact will add charm and a good heat source to any small space. 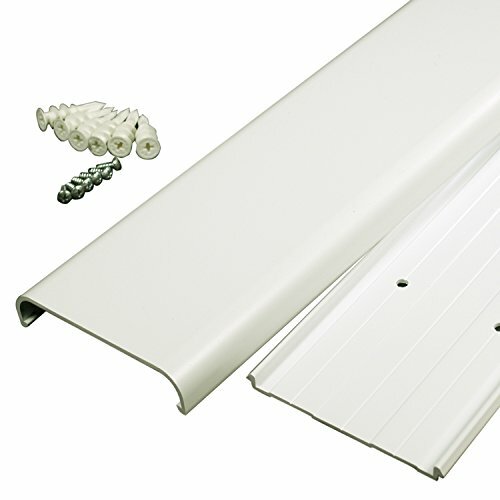 There is no installation required as it is a freestanding unit. You can have your stove set up in minutes. The flame effects are realistic and provide good ambience. It is economical to run and will provide a cozy feeling to your room all the year around. The flame effects are provided by patented technology and are unique to Dimplex. The flame effects are pretty realistic, and there are logs and burning embers as well. The flame effects can be operated without the heater being switched on, or will operate with the heater. The flame effect intensity and brightness are not adjustable, but they do produce a nice soothing effect. There is a light bulb for the flame illumination which can be replaced. The flames are LED powered and these will not need replacing. There is a large plastic viewing panel at the front of the stove to display the realistic flame effects and the burning logs. Dimplex claim that the flame effect is the most realistic on the market. The clear plastic panel at the front of the stove never gets hot, so there are no risks of burns if it is touched. The Dimplex Compact uses 90% less energy than a gas stove to produce the flame effect. I believe it is very important that everyone purchasing an electric fireplace heater be aware of the limitations of these units. 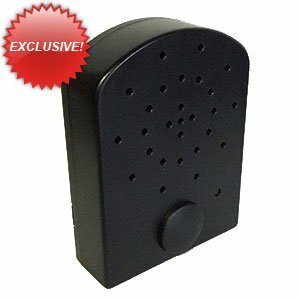 With very rare exceptions and this compact electric fireplace heater is no exception, an electric fireplace heater is best thought of as a supplemental heat source. Or part of a comprehensive zone heating plan. Quite simply they will not heat your whole house. There is a heater unit attached to the bottom of the stove and this uses fan forced air to heat the room. The Dimplex technology ensures that the fan is almost silent in operation. Heat comes from the bottom of the stove. The power cord is around 6 feet long and is fitted with a standard plug. 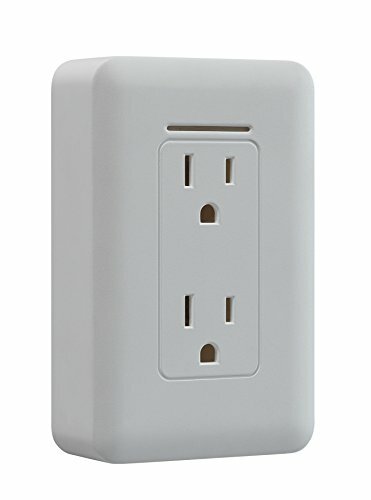 All you need to do is to plug the stove into a standard electrical outlet. The heater has two settings which are low and high heat. The output of the heater is designed to heat a room of up to 400 square feet. It is estimated that the heater will provide heat for around 9 cents per hour, which is very economical when compared to propane gas and other gas methods. The heater will output around 5,000 BTU’s or around 1,500 Watts. You are currently reading about Dimplex entry level fireplace. These other 2 fireplaces are both Dimplex Electric Fireplace Stoves at differing price points and features. They offer better flame effect technology and more realism. Click on text link to go straight to the comprehensive review. Click on the image for current discount pricing at Amazon. 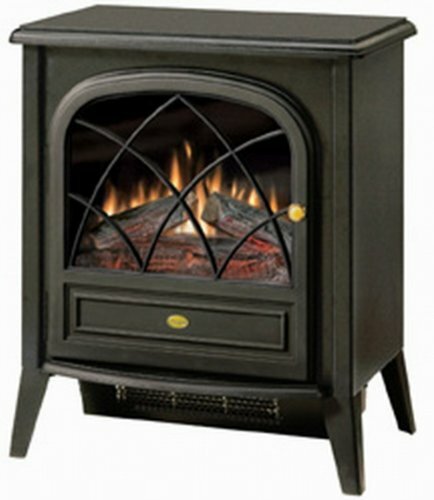 Click here for: Dimplex Portable Electric Stove Review The ‘Celeste’ top of the line. 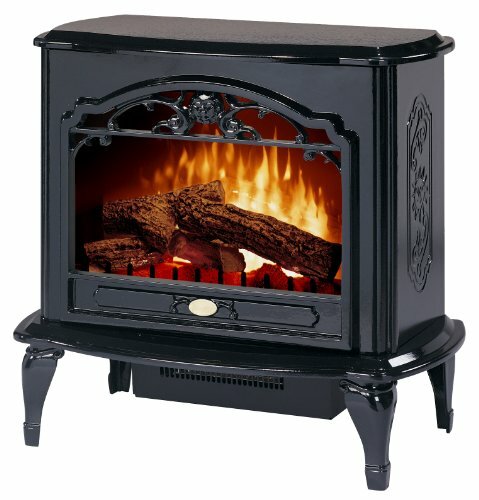 Click here for: full review of the Dimplex electric fireplace stove. The mid-range entry. Update: We have just completed a Dimplex fireplace stove shoot out. For a comparison of all three models Click: Comparison Review of the Top 3 Dimplex Portable Fireplace Stoves. There are three manual switches which are located on the right hand side of the heater pan. The first switch is the power on / off switch which provides the power to the flame effects and to the heater. When you turn this on the heater will not be switched on, but the flame effects will be. The second switch is the low heat on and off switch. When this is switched on, power will be supplied to the heater element and the heater fan and it will operate in the low heat mode. The third switch is for the high heat mode, and operates the same way as the second switch. To obtain high heat both the low heat and high heat switches must be on. There is no remote control supplied with the Dimplex Compact. There is an automatic cut out device to prevent the heater from overheating. If this is activated, then the heater will not come back on until this has been reset. This is achieved by turning the main on and off switch “off” and waiting for 5 minutes. What does that mean? If you use your unit in high heat mode for 3 hours a day for a month it will bump up your electric bill by about $9.00 per month. In flame effect only mode, same conditions your bill would go up by $.90. 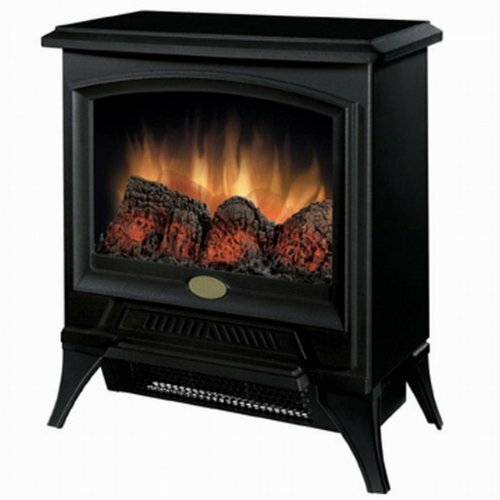 This Dimplex Compact stove measures 17.5 inches wide by 12 inches high and 21.8 inches deep. The stove only weighs 30.2 pounds, and this means that it can easily be moved from room to room. The stove has a limited 90 day warranty that covers parts. A lot of customers felt that the Dimplex Compact was very good value for money and some said that they would buy more of the units for other rooms. The fire effect has been described as “wonderful” to “pretty good”. The coals were considered bright and big and the flames beautiful. There were several customers who were very happy with the heat output of the stove. A lot said that the heater was more powerful than they thought, and one described it as a “powerhouse”. Customers described the stove as stylish and beautiful. A lot of customers were impressed with the design, and felt that it fitted in perfectly well with any room in their home and their places of work too. There were numerous comments about the good build quality, and how impressed people were with the overall quality of the unit. Some customers said that they had owned the stove for a long time and they never experienced any problems with it. A small number of customers experienced a problem with the illumination light. Most customers did not experience this. The light is pretty easy to change if it does stop working. There were a few people who claimed that the fan stopped working in their heater very quickly. There were not many of these complaints, and most were covered by the warranty on this. A couple of people had a problem with the plastic display that shows off the fire effect. One reported a burning smell and said that the plastic had melted. This should not happen and most people did not experience this. A couple of customers complained that the flame effects suddenly stopped working on their stove. This was certainly not a major issue as the majority of users had not complained about this. The biggest selling feature is it’s low price. There were a large number of reviews for the Dimplex Compact stove and 48% of these reviewers gave a 5 star rating to the product. A further 18% gave it a 4 star rating which makes 66% combined. Most of the reviewers were very pleased with the stove, and only a small number of people experienced problems with it. The Dimplex Compact is a lot of stove for the money. It has a good heat output and the flame effects are very good. It is easy to control and inexpensive to run. If you are looking for a budget stove then the Dimplex compact is recommended.